In order to achieve the best results while gaming, it’s important to use a proper mouse pad. There’s a wide choice of mouse pads on the market, and today we’re going to show you some of the best mouse pads for gaming. What is the best gaming mouse pad? First gaming mouse pad on our list is Roccat Taito Control. This mouse pad comes in two sizes, medium and compact. The medium size pad measures 400 x 320mm while the small one is 275 x 220mm in size. 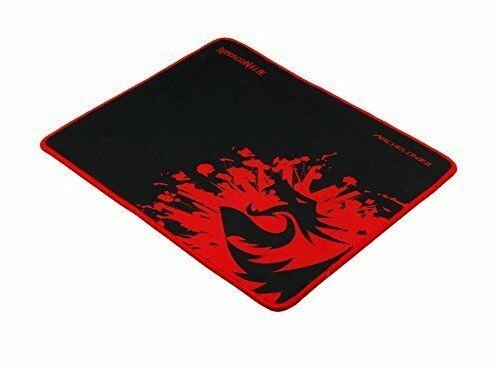 This mouse pad is durable so it will withstand hours of intense gaming, but besides durability the pad also offers smooth surface and precision. The pad is 3mm thick and it has a stitched border that won’t get worn out after hours of usage. There’s also a rubberized backing so the pad won’t move while using it. As for the design, this gaming pad comes in black color with a light blue edge offering a minimalistic design. 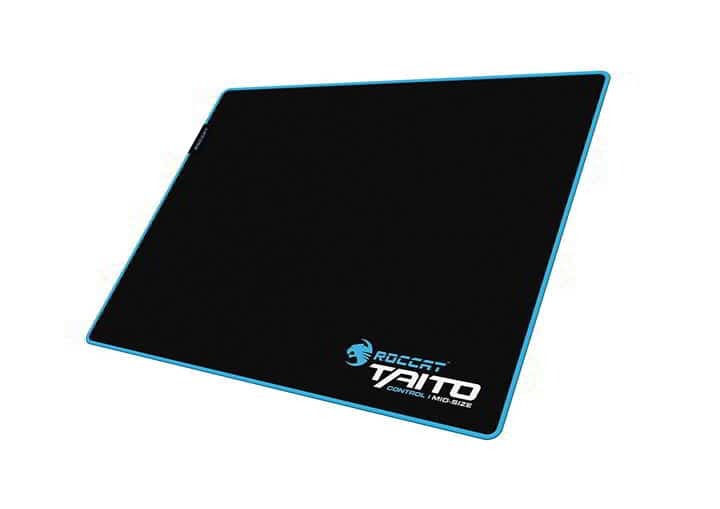 Roccat Taito Control is a solid gaming mouse pad, and it offers smooth and large surface along with decent durability. If you’re looking for a gaming mouse pad, Logitech G440 might be just what you need. This pad has an ultra low surface friction so it offers high sensitivity. As for the surface, it’s made from polyethylene that allows you to move your mouse using minimal force. To prevent any interference, this mouse pad comes with clean texture ensuring maximum accuracy and performance. Logitech G440 has a rubber base ensuring your mouse pad stays in its position even during intense gaming sessions. It’s worth mentioning that this is a multi-layer pad and it comes with three different layers. The surface is made from polypropylene so it reduces the friction. Second layer is high-impact polystyrene core that offers a solid foundation. Lastly, there’s a rubber surface at the bottom ensuring your mouse pad isn’t moving during intense gaming sessions. As for the size, this mouse pad measures 11.03 inches in height and 13.39 inches in width. Just like the previous entry on our list, this pad is about 3mm thick. Logitech G440 offers a clean design and great performance, so it’s perfect for gamers and advanced users alike. Using a larger mouse pad has its advantages, and if you prefer larger mouse pads, you might want to consider this model. The pad has a smooth and durable surface, and thanks to the stitched edges you won’t have any issues with fraying. This pad comes with textile-weave and it offers consistent accuracy along with low friction. This pad is compatible with a wide range of peripherals and it should work perfectly with any laser or optical mouse. Of course, the pad comes with anti-skid rubber base so it will remain fixed in place during gaming sessions. As for the size, this mouse pad is 930mm x 300mm x 3mm in size, so it’s not the most compact pad on our list. 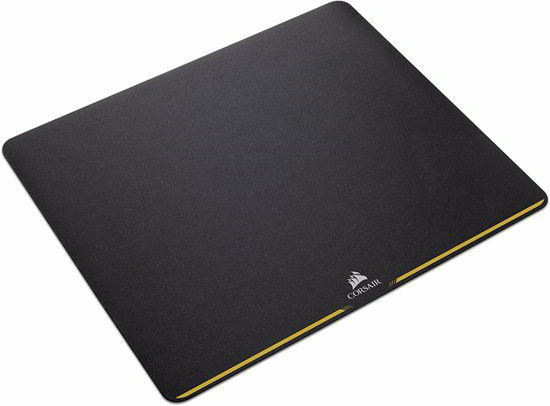 However, if you need a large mouse pad that offers precision and durability, we highly recommend you consider Corsair MM300. In addition to precision, this mouse pad offers great design, so it will be perfect for every gamer. If you’re looking for a mouse pad that can glow in dark and change colors, you should definitely consider Corsair MM800 RGB Polaris. 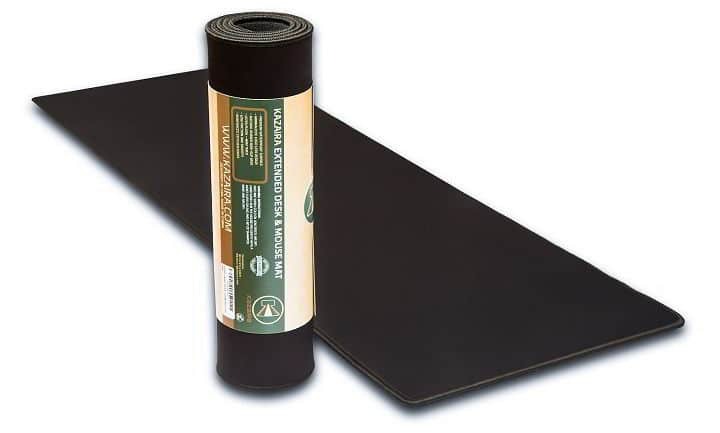 This is a durable mouse pad and thanks to the micro-texture surface it provides great precision. As for the size, this mouse pad measures 350mm x 260mm x 5mm in size. 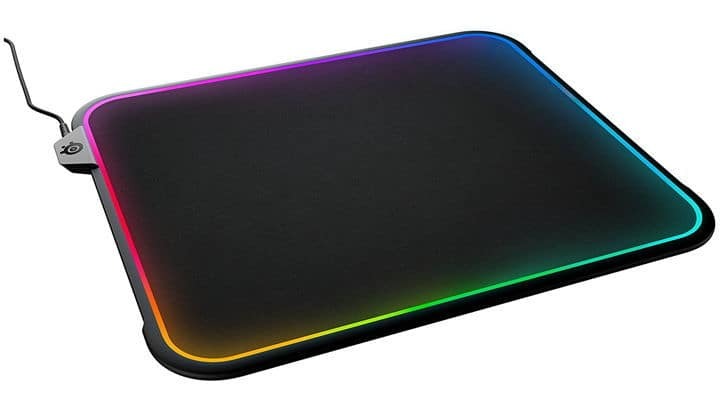 Unlike regular mouse pads, this one comes with 15 individual RGB zones and each zone is powered by PWM lighting. Speaking of lighting, you can even synchronize each lighting zone with other Corsair RGB products using CUE software. We have to mention that each lighting zone is customizable so you can use different color combinations. This pad also comes with a built-in USB pass-through port that you can use to connect your mouse. The pad is precise, and it provides low friction which makes it perfect for both laser and optical mice. 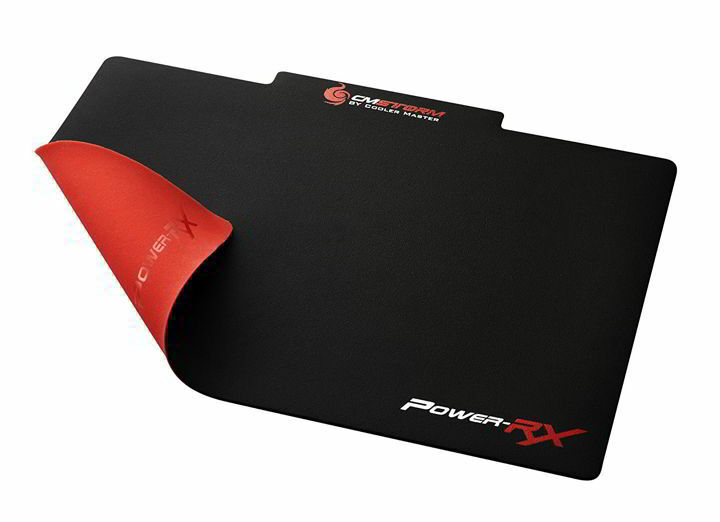 Of course, the mouse pad comes with a rubber base so your pad will remain still even during intense gaming sessions. Corsair MM800 RGB Polaris is a great mouse pad in terms of precision and durability, but it’s highlight is the RGB lighting. This pad offers great design, and the LED lighting enhances the look of the pad in low-light conditions. If you enjoy gaming in low-light conditions, you might want to consider Razer Firefly Chroma. This mouse pad comes with micro-textured surface so it offers a perfect balance between control and speed. It’s worth mentioning that this pad has a hard finish that offers maximum accuracy. Just like the previous model, this one also comes with LED lighting and you can easily configure and choose one of 16.8 million background colors. In addition, you can also toggle through various lighting effects. Of course, Razer Firefly Chroma is fully compatible with other Chroma devices, so you can easily synchronize them. The pad also has a non-slip rubber base so it will remain in its place even during intense gaming sessions. There’s also a 7ft braided fiber cable with USB connector for power. As for the size, the pad is 13.98 inches in width and 10.04 inches in height. In terms of thickness, this pad is about 0.16 inches. 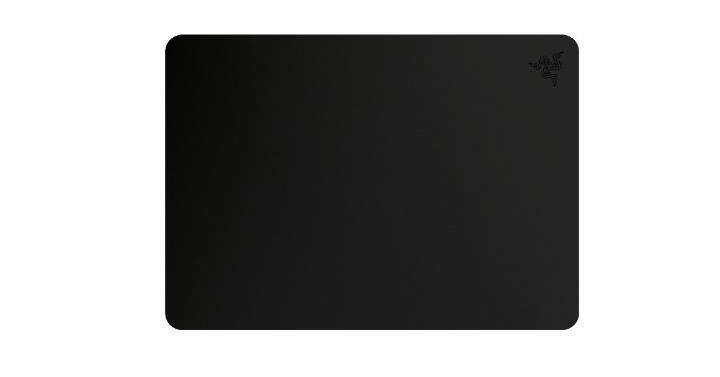 Razer Firefly Chroma is a great gaming mouse pad and it comes with hard or cloth surface. 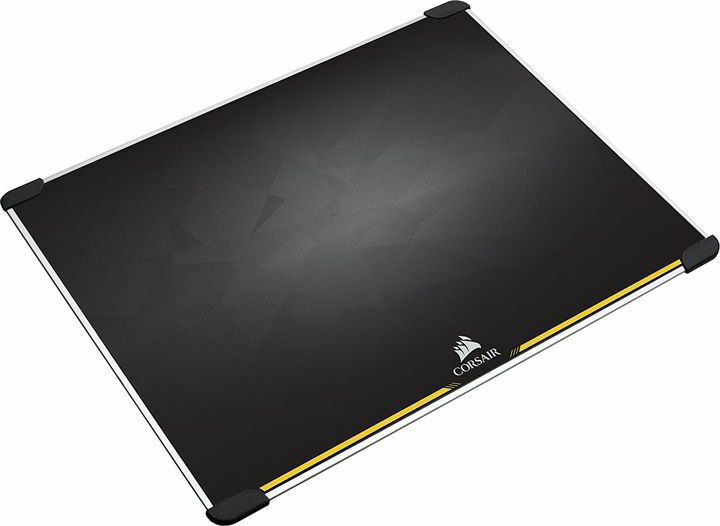 Another great gaming mouse pad that we have to mention is Corsair Gaming MM600. This is a two-sided mouse pad and you can easily use any side. Both sides are different and one side comes with smooth-texture offering high speed. The other side comes with a heavy texture so it offers exceptional control. Unlike other mouse pads, this one comes with 3mm thick aircraft-grade aluminum as foundation. As a result, this pad offers great durability and it will withstand even the most intense gaming sessions. In addition to aluminum foundation, this pad has no-slip rubber corners ensuring that your pad doesn’t move while you use it. As for size, this mouse pad measures 352mm x 272mm x 5mm so it offers more than enough space. Unlike other pads on our list, Corsair Gaming MM600 offers a dual-side design allowing you to easily switch between low-friction or high-control surfaces. If you’re looking for a simple mouse pad that doesn’t have any extra features, you might want to consider SteelSeries QcK+. This is a cloth pad, but it comes with high thread count and surface variation providing high accuracy for any type of mice. The pad also has a non-slip rubber base that will keep your mouse pad safely in place. The cloth offers nearly frictionless surface so you can perform smooth mouse movements with ease. As for the size, this pad is 17.72W x 15.75H x 0.08 D in size so there’s more than enough space for you to use. If you prefer larger mouse pads, SteelSeries QcK+ might be perfect for you. This pad doesn’t offer any advanced features, but it comes with solid design and precision, so it’s perfect for any gamer. This gaming mouse pad comes with a slick and seamless surface so you can move your mouse without any problems. In addition, the pad also feels rather comfortable under your hand and it minimizes fatigue that can occur after long gaming sessions. This mouse pad is optimized for all types of sensors, so it will work with optical or laser mice alike. The pad offers a highly portable design along with great precision. The base is made from rubber in order to reduce any chance of slipping. Regarding the size, this mouse pad comes in four different sizes. The medium sized pad is about 10 in x 13.98 in and 0.12 in thick. 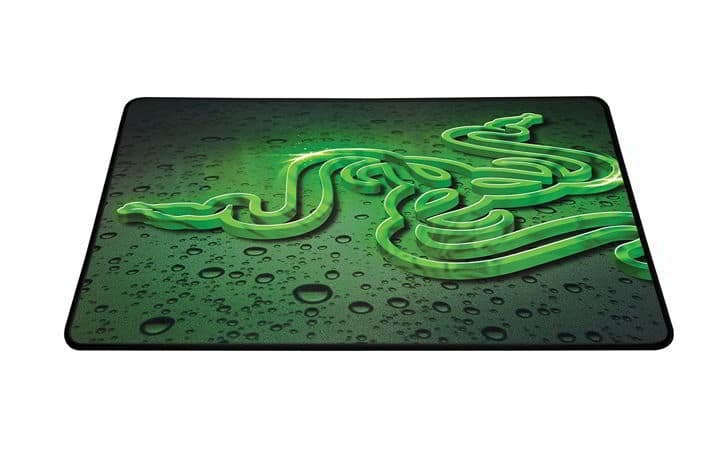 If you’re looking for a cloth mousepad, Razer Goliathus can be perfect for you. The pad has anti-fraying borders that will ensure the durability of your mouse pad. This mouse pad comes with a colorful design, and even though the design looks amazing, some users might prefer a more subtle design. Another gaming mouse pad that we want to show you is Razer Sphex V2. This is an ultra-thin mouse pad, so it’s perfect if you don’t want any extra elevation from the desk. As for the thickness, this pad is only 0.02 inches thin, so it’s rather slim and lightweight. The pad is optimized for speed and control and it works perfectly with any type of mouse. 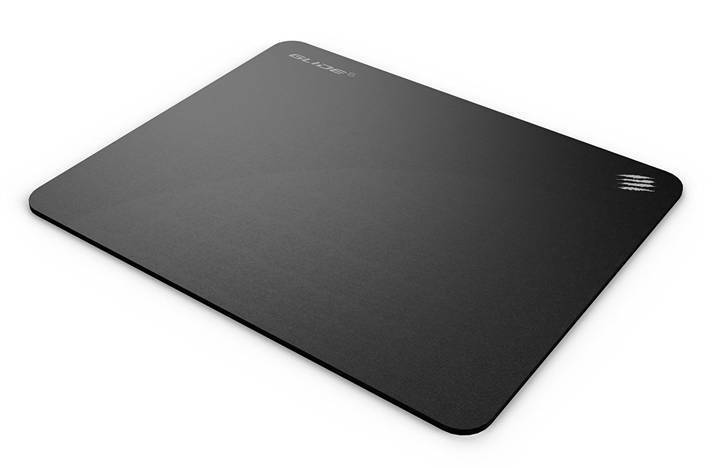 Despite the ultra-thin design, this mouse pad has an extra durable polycarbonate surface. Thanks to the extra durability, this mouse pad will withstand hours of intense gaming sessions. It’s worth mentioning that this pad comes with adhesive base so it will remain in place during gaming sessions. Razer Sphex V2 comes with a colorful design, and it’s perfect if you prefer ultra-thin mouse pads. On the other hand, if you’re looking for a softer mouse pad, you might want to skip this model. In terms of size, this pad is 14 in x 10 in, and there’s also a Mini version available. If you’re looking for a larger mouse pad, you should definitely check out products from Reflex Lab. This mouse pad comes with ultra smooth surface so it offers low resistance allowing you to move your mouse easily. The pad is 5mm thick so it’s rather comfortable to use and it won’t cause fatigue after long gaming sessions. It’s worth mentioning that this gaming pad comes with waterproof coating so your mouse pad will remain protected from accidental spills. Of course, the pad has anti-slip rubber bottom ensuring your mouse pad stands still even during intense gaming sessions. This pad also has high quality stitched edges in order to prevent fraying. In addition to durability, the pad is also machine washable so you can easily clean it. Regarding the size, the pad measures 15in x 11in so it offers enough space. Reflex Lab Gaming Mouse Pad is a solid gaming pad and it comes in several sizes. 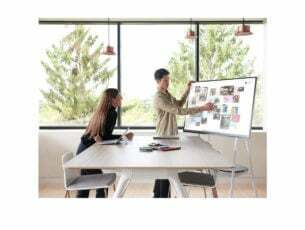 15-inch models will be perfect for most users, but there’s also a 36-inch model as well as a 9-inch model for users that want to save space. Each model comes with different colored border to choose from. Good mouse pad doesn’t have to be expensive, and if you’re looking for a new gaming mouse pad, we have to recommend Corsair MM200 Control. The pad offers great control and accuracy thanks to the textile-weave surface. Of course, the pad is optimized for all kinds of mice, so it will work perfectly with both laser and optical models. 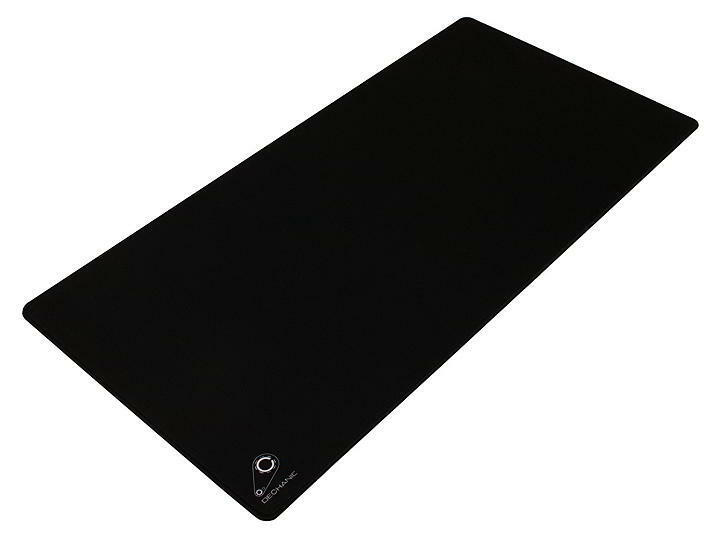 As for the size, this mouse pad is 360mm x 300mm x 2mm so it’s not the largest or the softest mouse pad on our list. If you find this pad to be too small for your needs, there’s also an extended model available, so you might want to consider it instead. 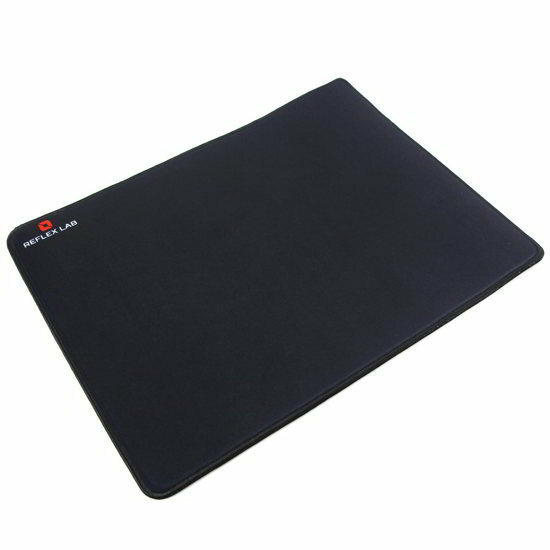 The pad has anti-skid rubber base ensuring your mouse pad remains steady during the gaming sessions. Corsair MM200 Control is a simple mouse pad, and it’s perfect if you prefer thinner pads. This mouse pad has a low friction surface so it provides you with high speed and accuracy. SteelSeries Dex has a 3D surface with a unique pattern that makes this pad stand out from the rest. The pad has a cloth surface and a silicone base so your mouse pad will remain steady while using it. It’s worth mentioning that both parts are sealed in order to reduce the chances of fraying. This pad is resistant to fraying and it also offers solid durability. As for the size, this mouse pad measures 320x270x2mm so it will be perfect for most users. The pad is washable and it looks great with its frictionless surface and silicone base. SteelSeries Dex offers amazing design along with solid precision and durability, so it’s perfect for gamers. If you’re looking for a gaming mouse pad, we have to recommend Mad Catz Glide 4. The pad is made from premium microfiber foam and it has a high-grip bottom for increased stability. In addition, there’s low-friction coating ensuring smooth mouse movement and speed. This pad works with laser mice, but it also has full support for optical ones. Thanks to the special weave pattern you’ll achieve outstanding results while using an optical mouse. 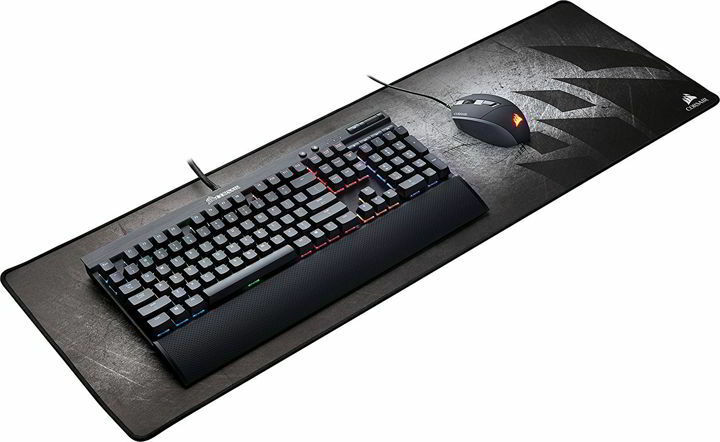 The mouse pad is 38 percent larger than average mouse pads, which makes it perfect for gaming. Thanks to the ultra-smooth surface this mouse pad provides you with great mouse tracking. Of course, the pad also has high-grip rubber on the bottom ensuring maximum stability. Mad Catz Glide 4 comes with great design, so it will be perfect for every gamer. Another great mouse pad for gaming is Logitech G640. This pad comes with moderate friction which is perfect if you use low-DPI settings for your mouse. Speaking of surface, the pad has a clean and consistent texture on it. 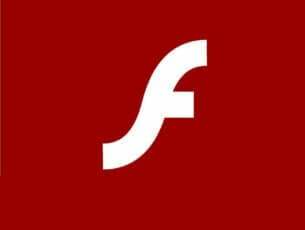 As a result, all your mouse movement will be perfectly translated. The pad also has a rubber base that will keep it in place while using it. It’s worth mentioning that this mouse pad has a soft fabric that offers comfort while reducing the wrist fatigue. 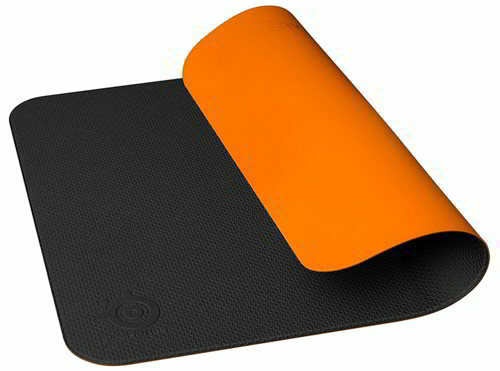 Lastly, this mouse pad is flexible and you can easily roll it and carry it with you. Logitech G640 offers a simple design, and it will be perfect for any gamer. As for the size, this pad is 15.75 in x 18.11 in x 0.10 in so it offers more than enough space. 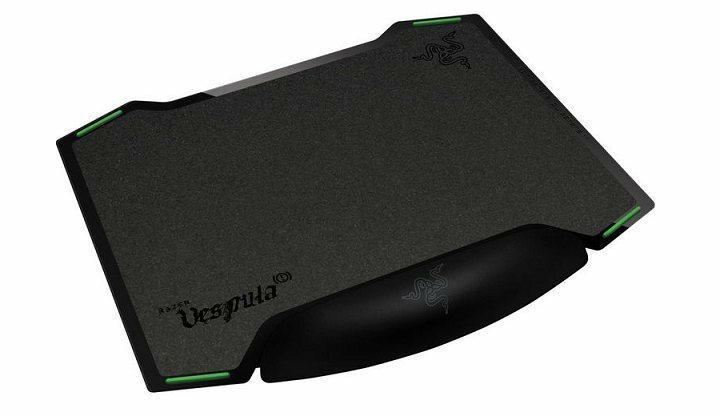 Another dual-sided mouse pad for gamers that we want to show you is Razer Vespula. Even though youcan use any side, you should know that one side is optimized for speed, while the other one offers increased precision. 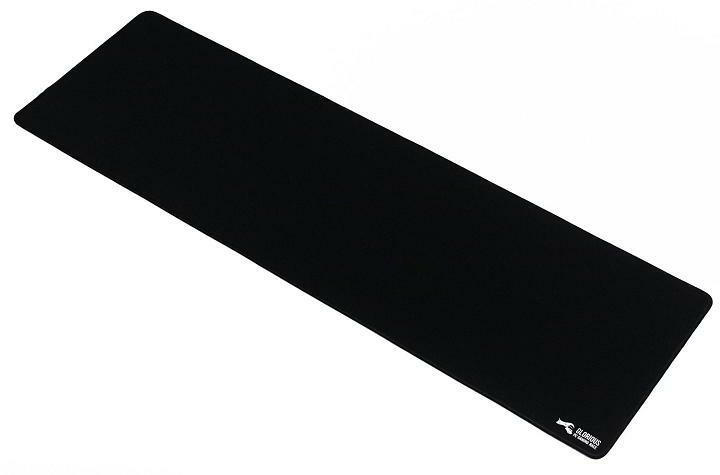 Unlike many other mouse pads on our list, this one comes with memory conformance wrist rest. 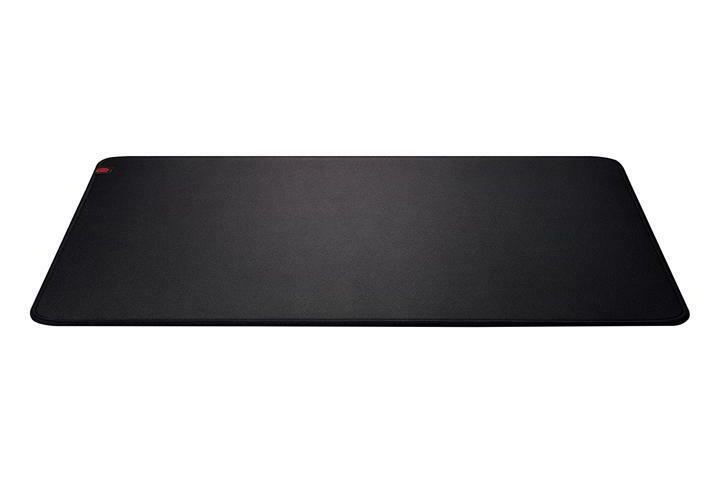 The wrist rest is filled with soft gel and it will protect your wrist from injury or fatigue. The pad also has a non-slip, anti-reflective, abrasion-resistant hard coat. Regarding the size, this pad is 12.61 in x 10.24 in x 0.79 in, so it offers enough space. Razer Vespula is a great mouse pad, and it offers solid performance alongside great design. If you’re looking for a stable gaming mouse pad, you should definitely consider this model. This pad has anti-fray stitched edges so it offers solid durability. The pad has a densely woven fabric that offers fine texture ensuring precision with your optical mouse. The surface is made from soft cloth so it offers comfort to your wrist while using it. At the bottom, there’s a layer of rubber ensuring your mouse pad remains perfectly still even during intense gaming sessions. HyperX Fury SPro is durable and with the densely woven surface, it will be perfect for any optical mouse. This mouse pad is available in four different sizes, and the smallest one is 290mm x 240mm while the extra large one is 900mm x 420mm. Using a larger mouse pad has its advantages, and if you’re fan of larger pads, today we might have the perfect model for you. 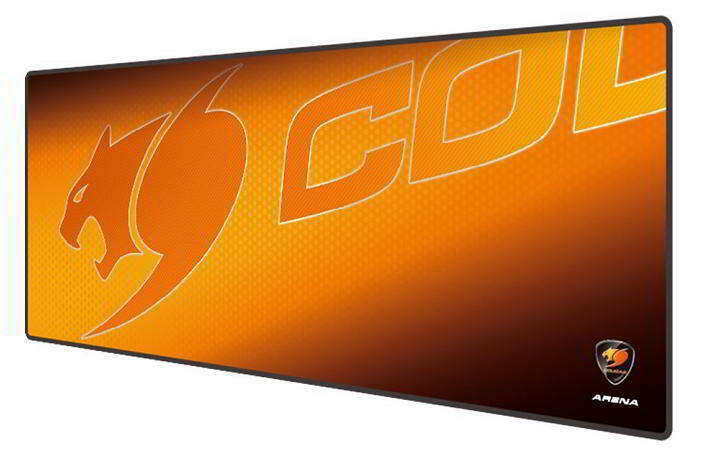 Cougar Arena is a large mouse pad so it offers more than enough space for all your gaming needs. Despite its large size, this pad also offers waterproof design as well as stitched borders. The pad is 5mm thick, so it will provide enough comfort during intense gaming sessions. The bottom of the pad is covered with rubber, but the rubber comes with wave-shaped design ensuring the stability of your mouse pad. As for the top surface, it’s made from cloth and it offers solid precision during gaming sessions. This pad measures 31.49 in x 11.81 in size so it provides more than enough space. Cougar Arena comes with a solid and durable design, and the top surface is covered by a full-width Cougar logo. The surface looks visually appealing, but some users might prefer a more subtle design. Another mouse pad for gaming that you might want to check out is BenQ ZOWIE G-SR. 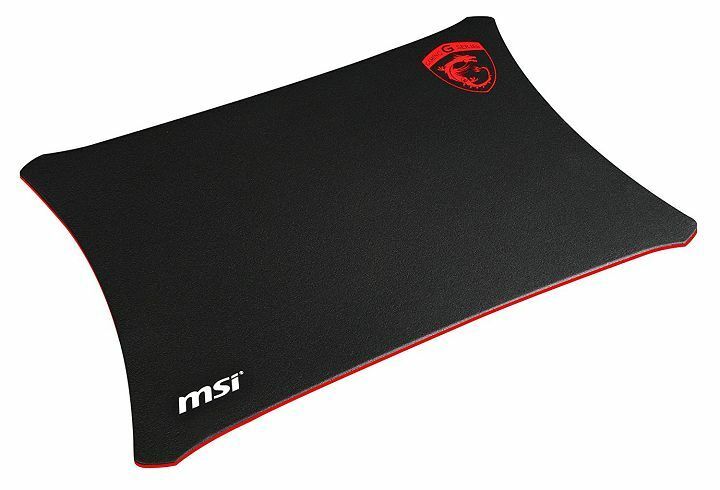 This is a cloth mouse pad, but it comes with rubber base ensuring your mouse pad remains still during gaming sessions. The top surface is smooth and with even texture it provides great accuracy. Regarding the compatibility, this mouse pad will work with any type of mice. As for the size, this pad is 18.9 x 15.7 x 0.14 inch so it offers enough space for all your needs. BenQ ZOWIE G-SR is a solid mouse pad, and it will be perfect for gamers that prefer larger gaming pads. As for the price, you can get this mouse pad for $29.99 on Amazon. The pad has a rubber non-slip base so it will remain in place during gaming sessions. Of course, there’s anti-fraying stitched frame that will increase the durability of your pad. We also have to mention that this pad is machine washable so you can easily wash it. As for availability, the Extended version is also available in white color. There are also few other sizes available so you can get a smaller or a larger mouse pad depending on your needs. Another larger mouse pad for gamers that we want to show you is Dechanic XXL Mouse Pad. Thanks to the highly textured weave, the pad is optimized for extra control so it’s perfect for gamers. The pad is optimized for all mouse sensitivities and mouse sensors and it comes with an anti-slip rubber base that holds your pad in place during gaming sessions. The XXL version measures 36”x18” so it will be perfect for all your gaming needs. If needed, there are other sizes available as well. It’s also worth mentioning that this pad has an anti-fraying stitched frame that will enhance its durability. If you’re looking for a dual-side mouse pad, you might be interested in this model. Unlike other mouse pads on our list, this one is made from high-quality aluminum so it offers great stability and durability. 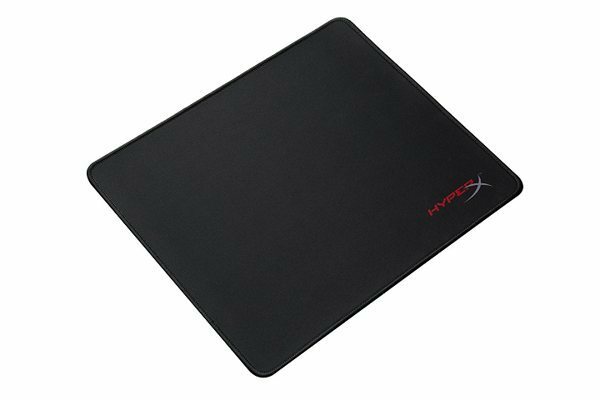 The mouse pad comes with large corner pads so it will remain in place even during intense gaming sessions. Since this is a double-sided mouse pad, you can easily use any side. It’s worth mentioning that both sides have different structures, and while one side is optimized for control, the other one is smoother and offers more speed. We have to mention that this mouse pad is only 3mm thin, and it comes with wrist rest that will provide extra comfort during long gaming sessions. 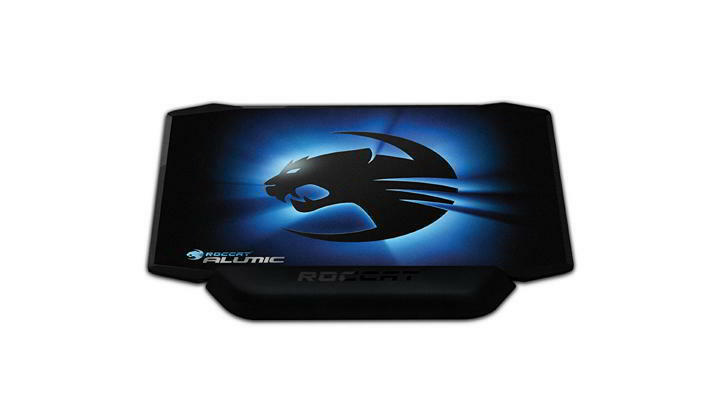 Roccat ALUMIC Double-Sided Gaming Mousepad is 331x272mm in size, so it’s compact and it will fit anywhere on your desk. The mouse pad also comes with easy to clean surface, so you can clean it in a matter of seconds. This model offers great design and durability, and if you’re looking for a double-sided mouse pad, you can order this model from Amazon. 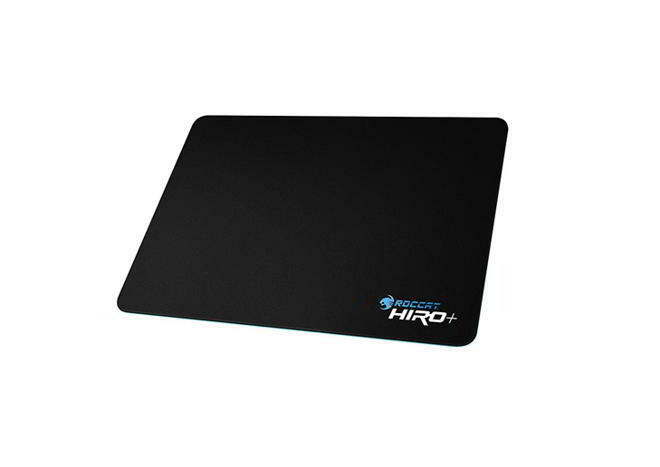 Another solid mouse pad from Roccat is Roccat Hiro+. This mouse pad offers solid acceleration and accuracy which makes it perfect for gamers. The pad has a vulcanized silicone surface with a complex 3D structure that delivers great speed and control for your mouse. Of course, the pad has a non-slip rubber base, so it will remain in place even during intense gaming sessions. Edges on this mouse pad are power bounded in order to prevent fraying and enhance the durability of the pad. The pad is also resistant to water and grime so you can clean it easily. Regarding the size, this pad is 350 x 250 x 2.50mm in size, so it offers enough space for average gamers. Roccat Hiro+ offers great design and solid durability, and you can purchase this mouse pad on Amazon. If you’re looking for a larger mouse pad, you might want to check out Ducky Channel Flipper. The pad is made from waterproof jersey cloth, so it can sustain accidental spills easily. In addition, the pad has a smooth tracking surface with mild textures providing you with decent precision. Like most mouse pads on our list, this one comes with rubber base that will prevent sliding and keep your mouse pad in place at all times. The pad is 800x350mm so it offers enough space for your mouse and keyboard. As for thickness, this pad is 3mm thick so it offers decent wrist support. Overall, Ducky Channel Flipper is a decent gaming mouse pad. It provides enough space as well as solid precision, so it’s perfect for gamers. If you’re looking for a large mouse pad, you can order this model from Amazon. Another model from SteelSeries that we want to show you is QCK Prism. This is a dual-side mouse pad, but it also offers LED lighting. To switch to a different surface, you just need to remove the mouse pad from its slot and flip it. Both surfaces are different, and you can choose between a premium hard polymer surface that offers great speed or micro-textured cloth surface for better control. 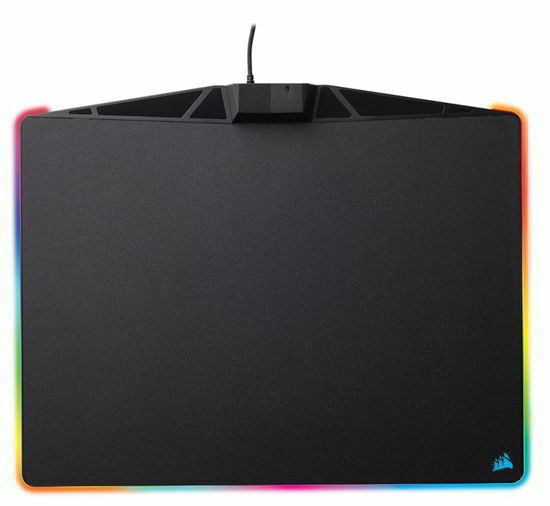 The pad also supports full RGB illumination and it comes with 12 different lighting zones. Colors are fully configurable and you can choose between millions of colors and achieve various lighting effects. The pad also supports GameSense Lighting and you can configure lights to behave differently depending on certain game events. There’s also support for PrismSync so you can easily sync the lights on your mouse pad with other Prism peripherals. SteelSeries QCK Prism is a great mouse pad, and it’s perfect if you want a dual-sided mouse pad that has LED lighting. The pad measures 14.04×11.51×0.34 in, so it should provide enough space for all your needs. If you’re looking for an affordable gaming mouse pad, you might want to consider this model. The pad is made from silk-processed cloth so it offers smooth mouse movement. As for the bottom, it’s made from processed foam rubber and it will keep your pad in place. The pad is made from super-fine and high-density materials and thanks to the water resistance you can easily clean it. The pad also offers decent durability and with the reinforced stitched edges you won’t have any issues with fraying. Redragon Archelon P001 is 12.99×10.24×0.2 inches in size, so it offers enough space for most gamers. If you need a larger pad, there are also XL and XXL sizes available. Another gaming pad that we want to show you is Hyetek Nebula. The pad is made from high-quality eco-friendly materials so it’s perfect for gamers. The pad also has stitched edges that prevent fraying and enhance the durability. As for the top surface, it’s made from ultra-smooth, low-friction fabric that provides you with exceptional tracking performance and precision. The pad also comes with non-slip rubber base that keeps your mouse pad in place even during intense gaming sessions. It’s worth mentioning that this pad is rather comfortable so it will reduce the chance of fatigue during prolonged use. Hyetek Nebula measures 13.97 x 10.00 x 0.118 in, but there are also Large and Extended models available if you need more space. As for the price, you can get the Medium model for $10.99 on Amazon. If you’re looking for a sleek mouse pad, you might want to consider Jelly Comb. The pad comes with strong aluminum construction so it offers great durability. In addition to durability, you can expect great mouse performance thanks to the smooth aluminum finish. The surface is micro sandblasted so it offers solid precision. Of course, the pad comes with a rubber base that will keep it in place while using it. Jelly Comb is a sleek and lightweight mouse pad, so it will be perfect for any user. The pad is available in black, silver and rose gold color, and there’s also a larger model available if you need more space. 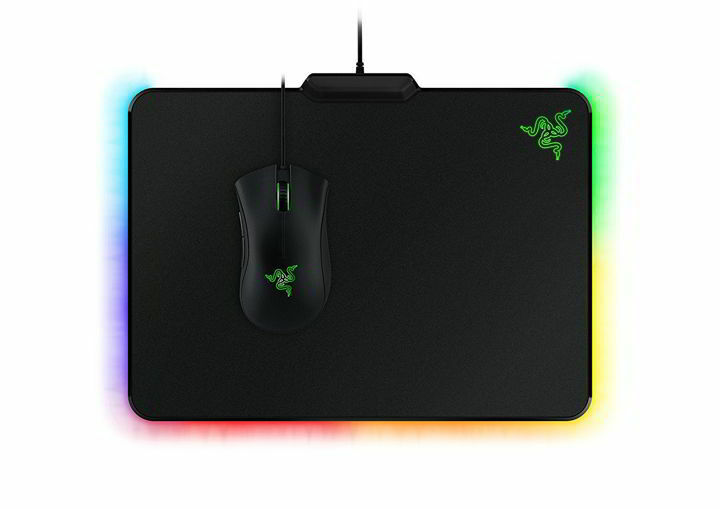 Another great mouse pad from Razer that we want to show you is Razer Gigantus. This pad is perfect for gamers that use low sensitivity settings because it comes with a large surface. Speaking of size, this pad measures 455×455mm so it offers enough space for most gamers. The surface is made from cloth and it has no elevations or depressions so it provides you with speed and accuracy. Razer Gigantus is 5mm thick so it’s rather comfortable to use and it won’t cause fatigue after prolonged gaming sessions. Of course, the pad comes with a rubber base that will keep it in place at all times. The pad also has anti-fray stitched edges on some models so it offers solid durability. Razer Gigantus is a great mouse pad for gamers that use lower DPI settings. If you’re looking for a gaming mouse pad, you might want to consider Cooler Master Storm Power-RX. This is a hybrid mouse pad and it comes with a low friction textured weave that offers great speed and precision. As for the bottom, it’s made of thin rubber compound and anti-slip silicon base, so it won’t move during gaming sessions. We also have to mention that the surface is ergonomic so it will prevent wrist fatigue and injury. As for the size, this pad is 450 x 350 x 2.5 mm so it offers more than enough space for all your gaming needs. This is a solid mouse pad, but keep in mind that this is an older model, so the availability might vary. Another simplistic mouse pad for gamers is Turtle Beach Mouse Pad. This pad comes with high-quality microfiber surface so it allows you to move your mouse smoothly. Just like many other pads on our list, this one comes with natural rubber base that prevents slipping. In addition to solid precision, this pad also has anti-frayed stitched edges that will increase the durability of your mouse pad. As for the size, this pad is available in three different sizes and the X-Large model measures 17.72×13.78 in. Of course, there are Wide and Medium models available if you need a different size. 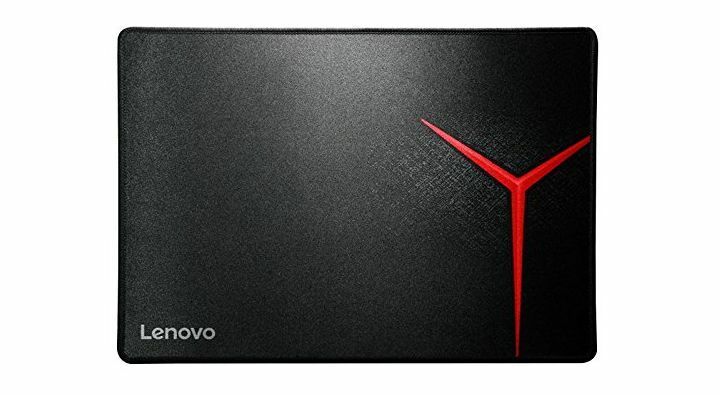 If you’re looking for a visually appealing gaming mouse pad, Lenovo Y Gaming Mouse Pad might be the perfect choice for you. The pad has a high-density waterproof microfibre surface that offers speed and accuracy. In order to provide you with solid durability, the pad has braided locked edges. The bottom is covered by skid-proof surface so your pad will remain in place during intense gaming sessions. Lenovo Y Gaming Mouse Pad is a wide mouse pad and it offers enough space for most gamers. The pad has a minimalistic and visually appealing design, so it’s perfect for all users. Another gaming mouse pad with an attractive design is MSI Sistrom. This mouse pad is made from silicon base, so it provides solid performance. The bottom of the pad is made from anti-slip silicon so your pad will remain in place even during intense gaming sessions. The top surface is 3D textured so it offers low friction and high accuracy. In addition to accuracy and speed, this pad comes with advanced edge cover technology that enhances the durability of your mouse pad by protecting it from fraying. The surface is also waterproof so you can easily clean it if needed. 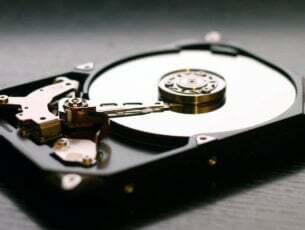 If you’re worried about fatigue, you should know that the surface is smooth so it won’t cause fatigue after prolonged gaming sessions. As for the size, this pad is 380 x 260 x 2 mm so it offers more than enough space for all your gaming needs. MSI Sistrom is a great mouse pad, and it offers amazing design and performance. If you prefer larger mouse pads, Kazaira Extended might be perfect for you. The pad comes with ultra thick and smooth surface that provides low friction and high accuracy. As a result, this pad is perfect for both optical or laser mice. As for the size, this pad measures 36×12 in so you can easily place your keyboard and mouse on it. The pad also has anti-fray edges that will increase its durability. We also have to mention that this mouse pad is completely black, and it doesn’t even have a logo printed on it. If you’re looking for a professional or subtle mouse pad, this might be the perfect choice for you. The pad is eco-friendly and its made from natural rubber and textile fabric. In addition, it’s completely waterproof so you can easily clean it. 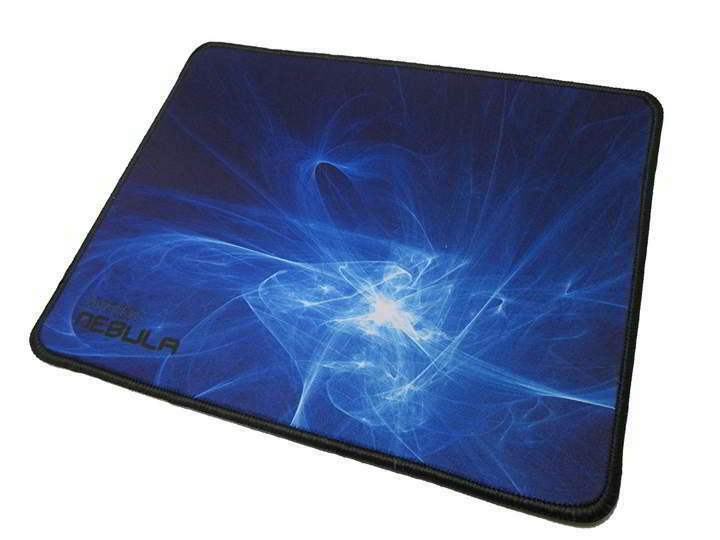 Kazaira Extended is a great mouse pad, and with its large size and simple design, it will be perfect for any user. Another gaming mouse pad from MSI that we want to show you is MSI ThunderStorm. This mouse pad has an aluminum base, and thanks to the conversion coating and hairline finish it offers great durability. Unlike other mouse pads on our list, this one comes with unique L-shaped design, so it looks great and it allows you more freedom to position your keyboard. The mouse pad has silicon feet that absorb the vibration and prevent sliding during gaming sessions. In addition, these silicon feet also provide additional comfort while using your mouse. MSI ThunderStorm is ultra-thin, and it has a smooth chamfer edge so it looks great. We also have to mention that this is a dual-side mouse pad so you can use any surface. Each surface has different features, and if you want maximum precision, you need to use anodized hairline finish surface. If you need more speed, there’s a microtexture surface that is perfect for low-sensitivity mice. Regarding the size, this mouse pad is 320x225x2mm so it offers enough space for most users. MSI ThunderStorm is an amazing mouse pad with its unique design and dual surfaces so its perfect for gamers. If you’re looking for a wide gaming mouse pad, you should definitely consider Vipamz Extended XXL. This pad is 36×12 in in size, so it offers more than enough space for serious gamers. Due to its large size, you can easily place both your keyboard and mouse on this mouse pad. The pad has a smooth cloth surface providing you with optimum speed and accuracy during gaming sessions. There’s also a rubber base that will prevent slipping and keep your mouse pad in place. It’s worth mentioning that this mouse pad is rather comfortable so you won’t experience any fatigue. The pad doesn’t have any uneven surfaces so you can freely move your mouse. Vipamz Extended XLL is also durable thanks to the waterproof design and anti-fraying edges. 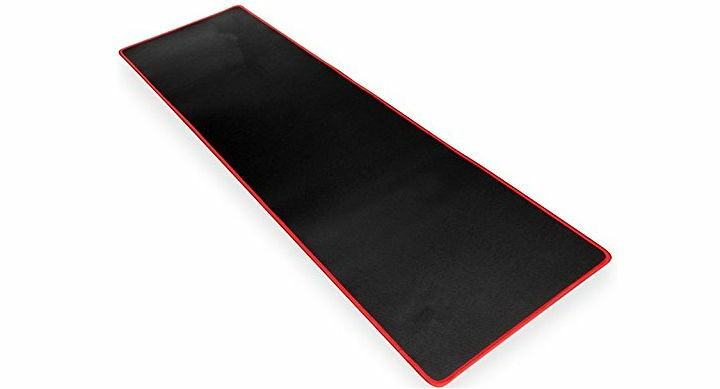 This is a great mouse pad, and there are models with black or red edges. If this model is too big for you, you should know that there are also smaller models available. If you prefer ultra-thin mouse pads, Kingston Technology HyperX Skyn might be perfect for you. This mouse pad is paper-thin, and it offers a hard surface for your mouse. Due to its ultra-thin design, this mouse pad offers almost no transition between your desk and the pad. The pad is optimized for extensive use, and it comes with an anti-microbial surface that prevents dirt and bacteria buildup. The bottom of the pad is adhesive so it will keep your mouse pad in place during intense gaming sessions. The surface is smooth and optimized for fast mouse movement. Speaking of mice, we have to mention that this pad is fully compatible with both laser and optical mice. 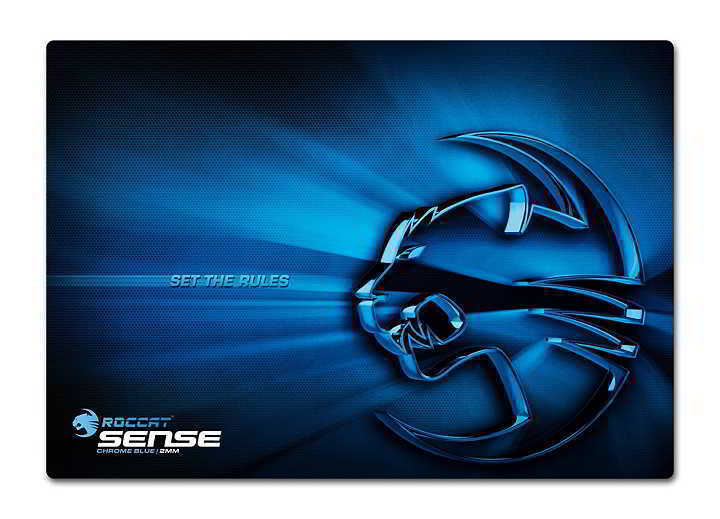 Another great mouse pad that we want to show you is Roccat Sense. This pad is made from ultra-soft cloth and it has friction-reducing microcrystalline coating. As a result, this pad offers both speed and precision during gaming sessions. Regarding the size, this mouse pad is 400x280mm in size so it offers enough space for most gamers. 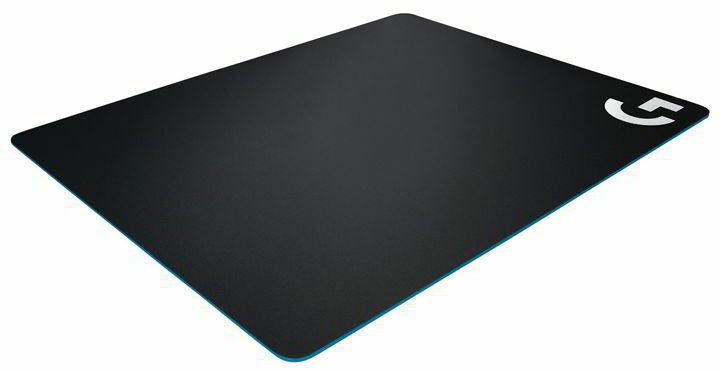 Speaking of size, Roccat Sense is only 2mm thin, so it’s perfect for gamers that prefer thinner mouse pads. Just like most mouse pads, this one also comes with rubber bottom so it will stand still during your gaming sessions. 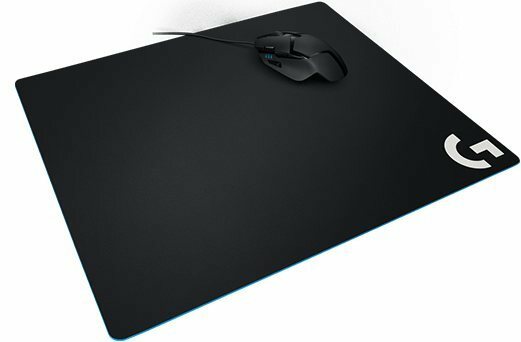 Roccat Sense is a solid mouse pad for gamers, and it comes with attractive design. However, if you prefer more subtle mouse pads, this pad might not be for you. 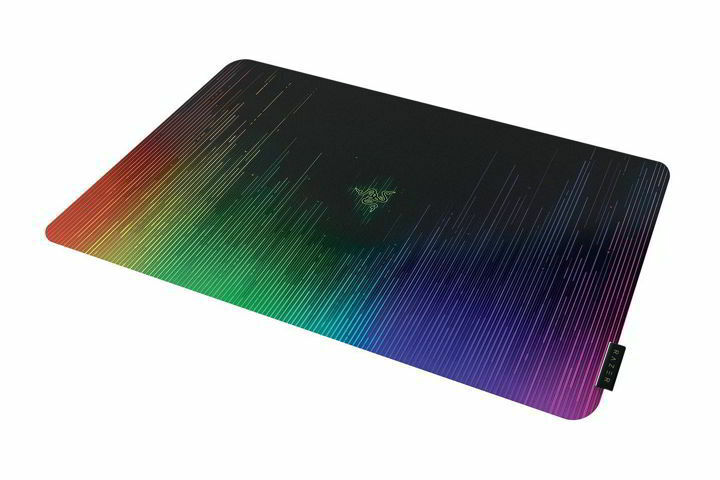 If you’re looking for a subtle gaming mouse pad, you should consider Razer Manticor. 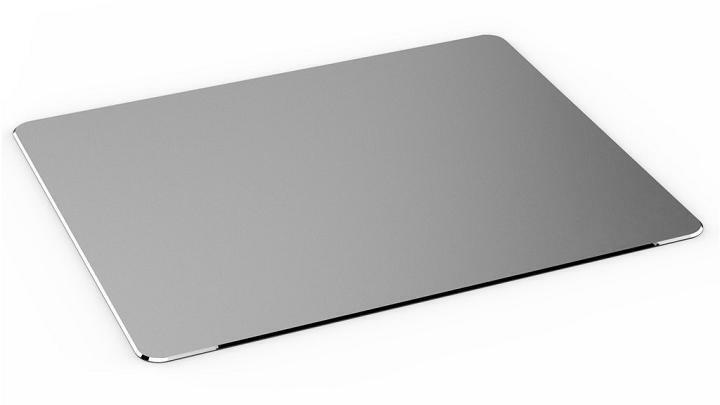 This mouse pad has a minimalistic design and it’s made from aircraft-grade aluminum. As a result, the pad is rather durable and thanks to the sand-blasted texture on the surface it provides you with great precision. This pad is rather thin and it measures 0.09”. As for size, this pad is 13.98”x10.04” so it offers enough space for all types of gamers. Of course, the pad has a rubber base that keeps it in place even during the most intense gaming sessions. Razer Manticor offers amazing design, durability and performance. This is a great mouse pad for gamers, and you can get it on Amazon. 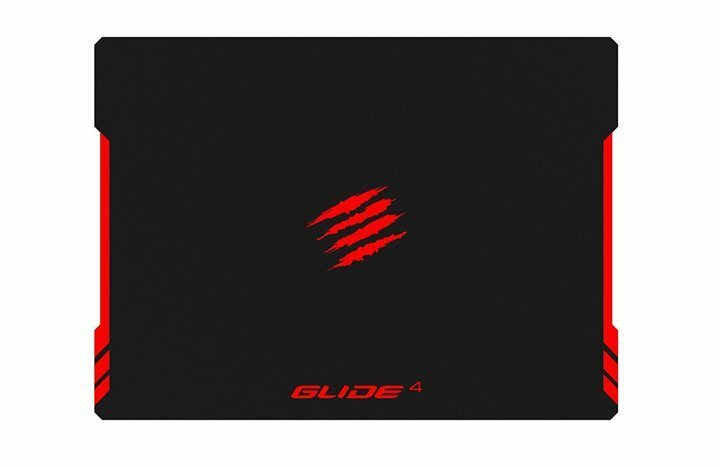 Another great mouse pad for gamers is Mad Catz Glide 6. This is a hybrid mouse pad, and it’s made from both cloth and silicone. As a result, this mouse pad works perfectly with any kind of mice. In addition to great design, the pad also offers solid control and maximum accuracy. The pad has a 3D cloth surface that offers 400% boost in sensor performance according to the manufacturer. The surface is smooth so you won’t experience any sudden mouse jumps during gaming sessions. The pad also offers decent durability with its waterproof design and head-bonded edges. As a result, your edges won’t fray and the pad will last longer. Thanks to the smooth edges, your wrist will always be comfortable, even during prolonged gaming sessions. As for the size, this pad is 150% larger than other standard mouse pads on the market, so it offers more than enough space. Mad Catz Glide 6 is a solid mouse pad, and it offers great and durable design. If you’re a gamer it’s important to have a proper gaming mouse pad. We covered various gaming mouse pads, and most of them are relatively affordable, so we’re certain you’ll find a suitable model for you.